She really did it. Cardi B now has the biggest song in the country. After weeks of leveling up its stream and sales numbers, “Bodak Yellow,” Cardi’s chilly anthem of impeccable contempt, finally climbed to the very top of the Billboard Hot 100. If it’s not the song of summer (that honor belongs to “Despacito”), “Bodak” is assuredly the song of the fall so far, bursting into prominence after a long period of gathering heat and momentum. It’s been tempting to view the struggle for the top spot between Cardi’s “Bodak” and Taylor Swift’s “Look What You Made Me Do” as not just a commercial clash, but as representative of broader social divisions. As a piece on Splinter helpfully pointed out last week, Cardi B is a black woman and Taylor Swift is saltine-pale. Now that “Bodak” reigns supreme and “Look” has fallen two spots to No. 3, it’s evident that we have a proxy for people of color dominating an avatar for white privilege. Score one for the underdogs in the racial Olympics, I guess. Sure, neither Cardi nor Taylor’s lyrics have content that could be plausibly described as political, but the tones and inflections of their voices speak volumes regarding their social backgrounds. You could never mistake one for the other, even on wax: Cardi’s hauteur is rooted in the grimy mazes of the Bronx while Taylor’s pristine snottiness comes naturally to someone born and bred to property. You’d have to have no social conscience whatsoever not to feel a vicarious thrill witnessing Cardi complete her ascension. Some narratives are true even when they’re not quite factual: Ten years ago the sales clash between Kanye’s Graduation and 50 Cent’s The Massacre was viewed similarly as a symbolic arm-wrestling match between boundary-pushing middle-class rap and gangster classicism. Cardi’s the first female rapper to stand alone at the top of the Hot 100 in nearly 20 years and only the second New York artist to top the chart this decade. Poor over rich, black woman over white, Cardi’s victory can evidently signify a lot. But more than anything it represents the vindication of good music, just as what “Look What You Made Me Do” stands for, first and foremost, is its absence. The fact that a song like “Look” could be lifted into the highest reaches of the charts at all testifies to the continued power of Taylor Swift. Even in commercial defeat and aesthetic decline the pop artist remains formidable purely on the basis of established market share and reputation. Had Taylor released a lead single for her upcoming Reputation that had even a quarter of the snap of “Bodak Yellow” it seems doubtful that it ever would have relinquished the top spot to Cardi; the fact that she didn’t, or couldn’t, says more about her stalled development as an artist and rather less about the nation’s intractable political divisions. She’s not some maggoty ogress, but rather a more common and banal creature, the type that takes decisive action and makes decisive statements only when her person or her revenue streams are directly threatened. Which is bad, and enables much worse, but to single her out when there are actual, elected, business-first representatives doing their utmost to deny health care to tens of millions of people seems inefficient and frivolous. Culture is inextricably linked to politics as much as it is to society or economics, and tracing those connections can be insightful and worthwhile. But rushing to reduce music to politics (except when musicians already rush to reduce themselves) is to do a disservice to both. 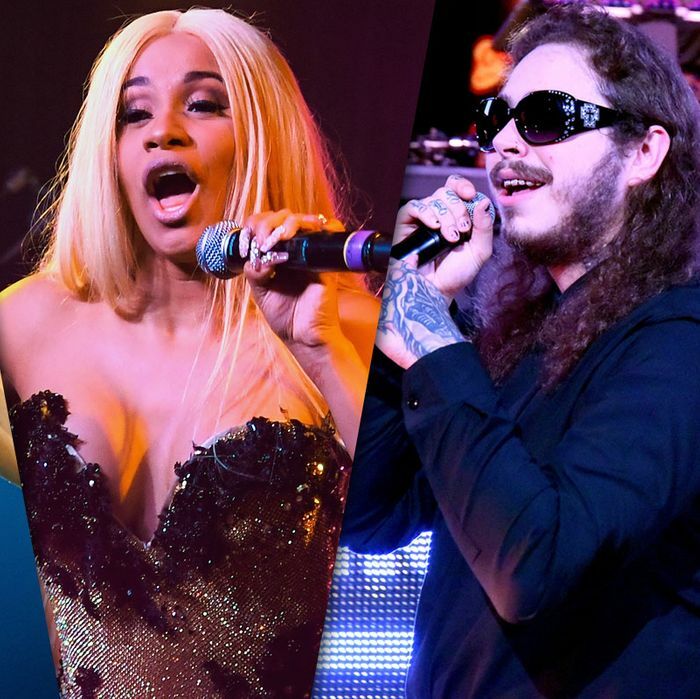 Post Malone always seems to find himself in the middle of things, and the chart this week reveals his fresh single “Rockstar” wedged between Cardi and Swift at No. 2. It’s an astonishingly high placement for the crossover artist that augurs well for his upcoming sophomore album Beerbongs & Bentleys; it won’t be surprising if “Rockstar” overtakes “Bodak” at some point for the top spot, nor, hopefully, would it signify all that much; like “Bodak,” “Rockstar” is a replica of Southern trap music so carefully put together that it could pass for the real thing. Yes, Post Malone is a white dude sing-rapping about “gas” and “shot-tas,” but his impression isn’t totally ludicrous (mostly thanks to Auto-Tune discoloration) and the beat, produced by Louis Bell and Tank, is a strong, solid copy of a Metro Boomin/Southside instrumental; just in case his street cred still seems dubious, the artist’s called on 21 Savage to deliver a guest verse. There are all sorts of weird, appropriation-adjacent activities afoot on the track, some of it white-on-white, or at least white-on-white-on-black; when he’s not busy claiming that his dudes smoke gas like Rastas, Post is seeing himself through the drugged, begroupied images of AC/DC and the Doors and the Rolling Stones. These are bands whose careful imitations of black music eventually amounted to something more original than mere duplication, and in laying claim to their heritage, the artist is effectively wagering that he can do the same. Even if it’s out of concern as to whether or not he could become to trap what Elvis was to rock and roll, he’s an artist worth watching. The rest of the top five, taken up by Logic’s hotline song “1-800-273-8255” at No. 4 and “Despacito” at No. 5, is as good a reminder as any that for better or worse, as of recently, the Billboard singles chart is the closest thing the United States has to a genuinely representative body. Now that youth-preferred streaming is counted alongside actual sales and radio play, the top five reflect the nation’s concerns more faithfully than Congress. It’s the only place where suicidal impulses, blaming others for triggering you, doing drugs, and Puerto Ricans longing for relief can receive something remotely close to a hearing proportionate to their urgency. As with any representative body, it’s still not entirely fair. Streams shouldn’t just count, they should count for more against sales and radio; and, of course, the fact that the population is something like three-quarters white gives white artists like Swift, Post Malone, and half of Logic a head start on the competition at once significant and incalculable. Given such circumstances, it’s truly a testament to her own prowess and ingenuity that Cardi B has managed to take the top spot. She bet that she could win a game rigged against her, and it paid off hugely. The fact that a song about looking down triumphantly on your enemies sits at the top of the charts is entirely fitting of the national mood — who doesn’t have enemies they need to snarl at? But the pure fact of her achievement — first place in America — belongs to her alone.